A game for Ludum Dare 40 : "The more you have, the worse it is". I was also inspired by other themes such as "One level, but it always changes". GooBall is a simple game where you need to collect a total of 200 GooBalls in five minutes. There are GooBalls spawners all over the map. 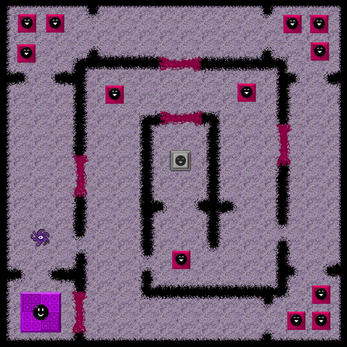 Your goal is to pickup these goos and bring them back to the main portal (the purple zone where you start) to save them. As you eat more and more goo you will become bigger, there are in total 3 phases. Each time you grow you can go on the slab in the middle to change the room's configuration and augment the quality of the goo pickups. As you save more and more goo, vortex will spawn on the map. If you touch them they will absorb 5 of your GooBalls. The GooBalls were living a happy life in GooLand when suddently they started to get pulled to another dimension, the Vortex Dimensions. Indeed it's inhabitants the Vortex like the taste of Goo. Your duty is to bring back the gooballs that are being sucked in this dimension back to their original one. Font from http://www.1001fonts.com/blow-font.html (this is the only asset I didn't make myself, but it's not in the original game anyway). I recommend all these tools they are really good (you might have slight problems acquiring my voice though). I like Asesprite so much (and spending hours tweaking sprites until they feel right) I practically losed a whole day doing only that. This wasn't my first jam, but it was my first Compo though. I had spent the whole week crunching to finish another game project so I was already dead before starting. I thought "pff I'll do a simple concept, finish it quickly and publish it" but that was without anticipating my polishing frenzy. I haven't even really totally play-tested the game so I'm sorry if there are bugs or more probably if it isn't very well balanced. Oh my god use a level editor for 2D maps, not Unity vanilla. Never again ! NEVER ! AGAIN !